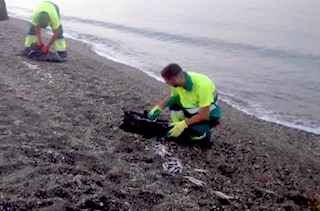 It was a beachgoer on Playa San Cristóbal in Almuñécar who found hundreds of dead fish, washed up on the shore yesterday. He contacted the Town Hall and the Councillor for Beaches (amongst other things) Luis Aragón who got onto the beach-cleaning company to clean it up. These workers soon filled 30 black-plastic, rubbish bags with over 300 kilos of dead fish, most of which were small bream and other fish that are not usually caught for domestic consumption. 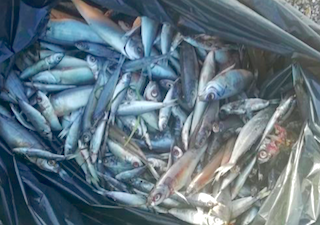 The Department of the Environment, also headed by Sr. Luis Aragón, contacted the relevant authorities to find out whether these fishes were deliberately dumped overboard from a fishing boat given their little worth, with the current and tide bringing them ashore or whether pollution was the cause. This entry was posted on Friday, September 21st, 2018 at 1:29 am	and is filed under Almuñécar. You can follow any responses to this entry through the RSS 2.0 feed.